The Grandstream GXW-4104 is an analog FXO gateway product that allows the small business and remote locations to connect with 4 PSTN lines. With the help of this product, they can connect to a traditional IP PBX System or even with an analog phone system. The 4 FOX ports provides four lines to connect to PSTN, and 2 switched 10/100 Ethernet ports that are routed to connect with your network. The Grandstream GXW-4104 is next generation IP voice and video gateway. It features full interoperability with the leading IP-PBX and server platform. This gateway provides superior voice and video quality along with traditional PBX telephony functionalities. All of this is wrapped up in easy deployment. This is a small business gateway that offers the video surveillance component. Also, the video surveillance port allows after hour security monitoring. It offers easy to manage and configure IP communication for business of all levels. It’s a great solution for communities in need to leverage the broadband network and add new IP tech to their current system. The Grandstream Enterprise analog VOIP gateway converts the SIP RTP I calls to traditional PSTN calls. The SIP proxy server and registrar server is deployed to handle the SIP register and call control. This improves the media conversion of IP and PSTN calls. This system is specifically designed to support the signaling standards of PSTN. The Grandstream GXW-4104 offers small enterprises, SOHO, and even the remote offices a cost effective VoIP FXO solution. Moreover, it provides business the chance to connect seamlessly with multiple locations along with 4 PSTN lines. All of this is compatible with IP PBX system and traditional phone system. Grandstream GXW4104 is the advanced low to mid-density analog gateway which features dual 10/100m network ports. 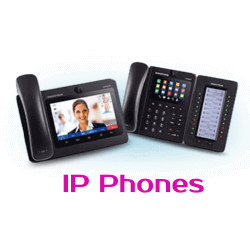 This is combined with an integrated router and impressive telephony features. It all tops up with comprehensive voice codecs and fax support with a flexible dial plan. The security protection features are sued for IP Enabling in traditional analog PBX with key systems, inter-branch office voice, and data communication. Apart from that, these are also used for PSTN trunk gateway for the Software-based IP PBX system. The T.38 AX Compliant features G.168 echo cancelation support as the Grandstream GXW-4104 also includes a video surveillance port just so the user can incorporate IP-based surveillance cameras into their security system.